The Red Sea remains a very attractive destination for underwater photographers for many reasons, not least for its spectacular big name sites. 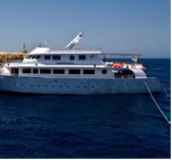 Famous dives like Tiran, Ras Mohamed, Abu Nuhas, the Thistlegorm or Elphinstone can be reached by day boats as well as live aboards but the more remote site of the Brothers islands is a different prospect. These two little rocky islands break the surface in the centre of the Red Sea in an exposed location too far from land for the day boats. So this is live aboard territory only and even then you need good conditions to make the crossing and dive safely here. 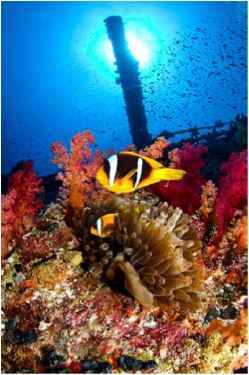 It is this very remoteness which makes the Brothers so attractive to both marine life and the diver and also makes it worth the effort of booking a trip dedicated to reaching this unique location. (Above) The main deck and walkways of the Numidia have been engidfed by the reef Nikon D300, Snbal ND20, Tokina 10-17mm zoom, Subtronic Minis, IS0100,fll 11125. (Top left) The shear walls of both islands provide endless opportunities for classic compositions of soft corals and approaching diver. Nikon D200, Snbal ND20, Tokina 10-17mm zoom, Subtronic Minis, IS0100,fll 11125. 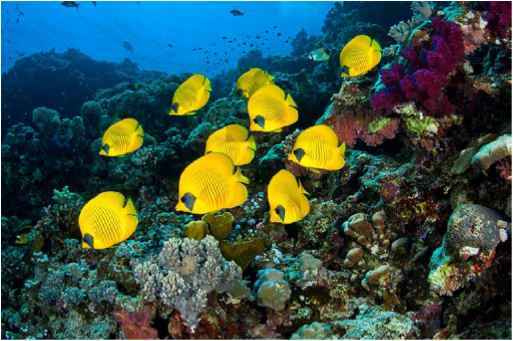 In the summer months it is not unusnal to find schools of masked butterfly fish which have gathered to spawn. Nikon D300, Subal ND20, Tokina 10-17mm zoom, Subtronie Minis, IS0100,f81180. of grey reefs, hammerheads and even a thresher shark amongst many other pelagics and reef fish. Some live aboards do make the trip here throughout the year if the weather is calm enough, but the most reliable months to plan a visit are between June and August. Later in the year there is a greater risk of high winds from the prevailing north east direction which can increase very quickly There is no shelter here and so the transit back to the mainland can be uncomfortable. Sometimes the weather is calm here which offers the opportunity to shoot with filters at the reef top in shallow wider. Nikon D200, SubalND20, Tokina 10-17mm zoom, Magic Filter, IS0100,fll 1160. Inevitably the wreck has become an extension of the reefand with that come all the usual suspects which of course includes clown fish. Nikon D300, SubalND20, Tokina 10-17mm zoom, Subtronic Minis, IS0100,fl6 11125.
dive time here. If you are lucky then the crossing will be calm and you will enjoy a good night's sleep. If the crossing is rough you may not be so well rested, but the excitement of arrival here at dawn and prospect of diving is normally enough to produce a small adrenalin surge to wake you up. 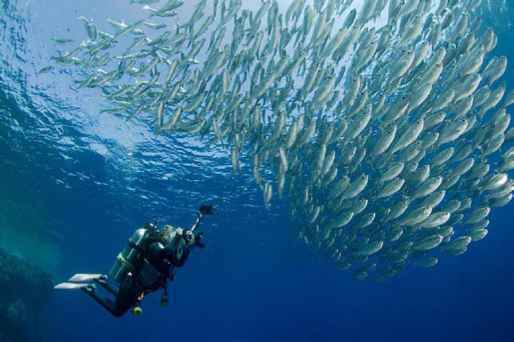 Including a photographer with this shoal of scad gives a good sense of scale as well as communicating an event with the image. Nikon D300, Subal ND20, Tokina 10-17mm zoom, Subtronic Minis, IS0100,fll 1/80. 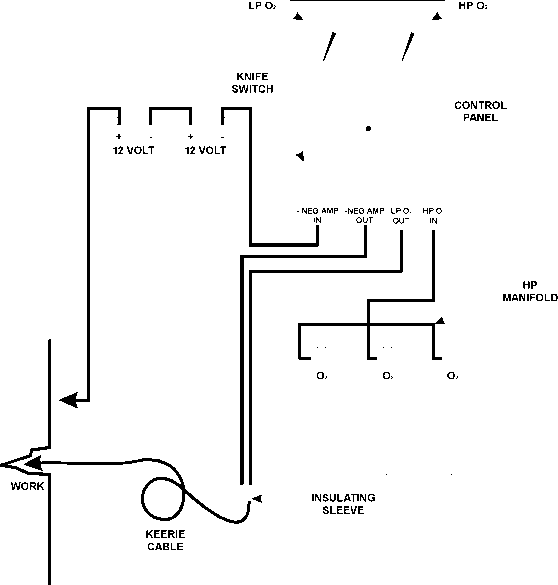 is most important as diving here can be hazardous unless you understand what the currents are doing and the pick up procedures after the dive. If you get carried away by the current then you are likely to travel a long way in open ocean, not a pleasant prospect. All this may sound alarming, but most of the guides working on the boats that come here are experienced and knowledgeable and if you follow advice and procedure you will be safe even when the weather is less than perfect. But remember to bring your flag and safety sausage! 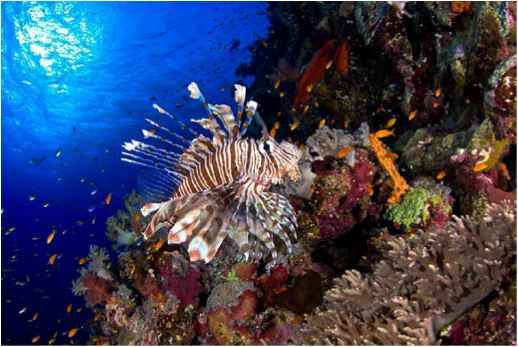 On early morning dives you will often encounter lion fish still out in open water hunting sometimes struggling to hold station in the current. Nikon D200, Subal ND20, Tokina 10-17mm zoom, Subtronie Minis, lS0100,fll 1160.
generally occurs right over the wreck of the Numidia which can create a 'dead zone' conveniently on the wreck which gives you the opportunity to explore here before riding the current for the remainder of the dive. 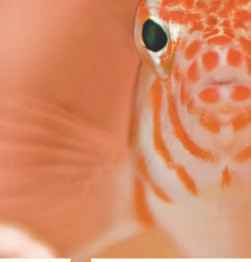 Batfish can be a co-operative subject and Imve an appealing face for a tight portrait with a nmcro lens. Nikon D200, Subal ND20,105mm micro, Inon Quad flash, IS0100,fll 11125. 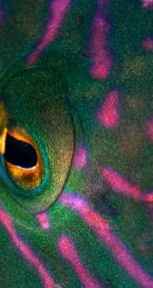 Fish eyes with a strong surrounding pattern nmke for great slightly 'abstarof compositions. Nikon D200, Subal ND20,105mm micro, Inon Quad flash, lS0100,fl611125. and make a short swim west to her remains, often against the current. Once you reach the wreck the current abates as it is splitting around the reef at this point so you can enjoy this part of your dive here with little effort down to a maximum depth of 40m or so at the stern. If the current is strong the fun starts when you leave the wreck either on the east or west side when you will be carried along the reef towards the southern end of the island. If you are on the western side you will soon pass over the remains of the second wreck here of the Aida, which is considerably deeper starting at 30m. This ship sank in 1957 when transporting troops to the island and can be more of a challenging dive as it is more exposed to the current and deeper than you may want to go so far from the nearest decompression chamber. Even when the current is strong you can find shelter on your way on the reef wall behind numerous indentations and overhangs on both sides of the island. On the west side the current normally becomes completely slack as you approach the jetty area which offers some excellent shallow diving at the reef top with plenty of macro opportunities. We normally dive here later in the day when the sun is on this side of the reef. On the eastern side the current will generally take you almost to the southern tip before it abates due to the orientation and configuration of the island. This area is marked by a collection of large gorgonian sea fans and continuing around the southern tip will bring you to the southern plateau which starts at around 20m at the base of the steep reef slope. This plateau is often visited by sharks and pelagics cruising out of the blue on the currents and there are also a couple of resident turtles. You might also be lucky enough to see dolphins here as they are often attracted by the diver activity around the island. The condition of the corals on both sides of the island is stunning and all the usual reef species are here. But if you have an interest in sharks then keep an eye on the blue especially on the early morning dives as they will often come in quickly for a look at you. If the current is not too strong then your guide may lead you out into the blue if you wish for a better chance of a closer encounter with Mr. Big. Little Brother offers something in the way of a contrast to the larger neighbour. The island is much smaller of course and the reef wall tends to be steeper, but the most overwhelming memory will be the colour. 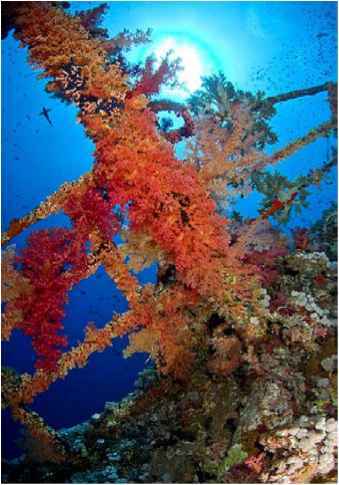 Little Brother's reefs are engulfed by soft corals wherever you look with the most amazing variety of colours and shapes. At the top of the walls the anthias school in their thousands and make a very striking contrast with the blue open water and vivid hues of the soft corals. The scarlet colour of carpet anemones always makes a striking contrast with the domino fish which often share them with the classic clown fish inhabitant. Nikon D200, Subal ND20, 105mm micro, Inon Quadflash, ISOlOO, f11 1/125. reef if you have the energy. 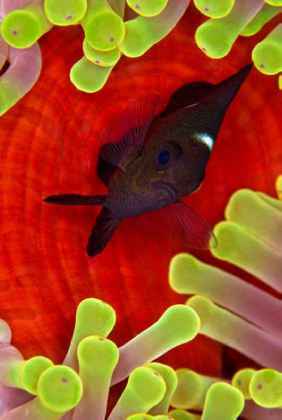 For me these quiet periods are best spent in a small area where the light is good and you can work on composing the dazzling soft corals and profuse reef life. Although Little Brother is smaller it is still worthy of at least a couple of days diving if your boat is spending several days at the Brothers. The larger and pelagic marine life on both islands changes with the seasons. 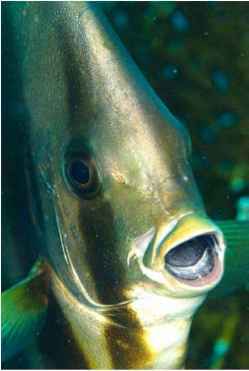 If you dive here in the spring and autumn months you may see larger schools of snappers, jacks, barracuda and groups of big tuna. In June and July many of these fish head north to join the breeding shoals in areas like Ras Mohamed, but there are still plenty of schooling fish to be seen. On my most recent trip we encountered a very co-operative school of scad which stayed in the same location on Big Brother for several days. Later in the year around the month of November the shark population increases as they come together to breed in the cooler waters but weather conditions are much less predictable. The question of which lens to use often arises on arrival at the Brothers. 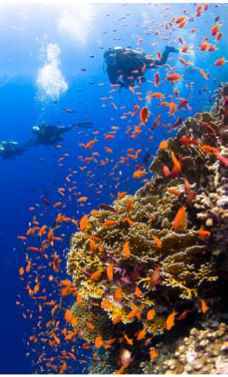 It is primarily a wide angle location for the wrecks, schooling fish and stunning corals. But do bring your macro lens as well as diving on the sheltered locations of Big Brother in particular is very productive and the jetty area is certainly worth more than one visit. Getting to the Brothers even at the optimal time of the year can be unpredictable and the diving can be challenging but once below the water it is all worth it. This location is deservedly a Red Sea classic and should not be missed.